I work for a proportion of each year on portrait commissions. I have completed more than 180 successful commissions during my career and have delighted clients all over Britain and abroad, with many clients returning for successive commissions. A portrait will not usually call for lengthy sitting times as I work mainly from photographs, although I do prefer to work from my own photographs and several photographic sessions can sometimes be necessary in order to proceed. 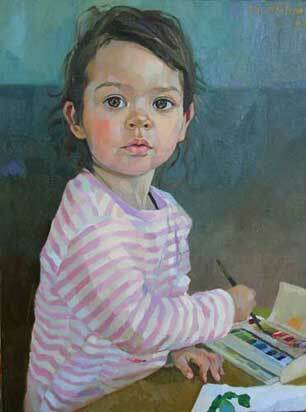 There is no particular age or type of person who makes a good subject; anyone can commission a portrait. The price is agreed in advance and will vary in accordance with the size, medium and number of subjects within the picture. A Price guide is shown below, but it may be adjusted to accommodate the needs of individuals or projects of unusual complexity. The fee is normally payable in it’s entirety on completion of the portrait to the client’s satisfaction. There is no charge for consultation prior to beginning work on the portrait commission, but it is occasionally necessary for very large projects to arrange an interim payment. I do my best at all times to work in accordance with my clients wishes and to provide satisfaction. If you think you might be interested in commissioning a portrait of yourself, a child or other family member or friend then please contact me via telephone or email. See contact page for details. Sizes are given in centimetres and prices are in pounds sterling based on a single portrait. Prices and sizes should be regarded as an approximate guide only.